Admittedly, I have not yet read “The Hawaiian Quilt”, although I intend to rectify that soon and delve into the backstory of some of the characters. 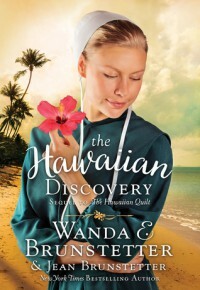 While “The Hawaiian Discovery” can be read as a standalone, there are spoilers for the first book. The Amish subgenre of Christian fiction is one that I’ve wanted to explore for a while now, and I’m glad that I finally had the opportunity to do so. The Amish community portrayed in this novel surprised me by being more progressive than I expected while still holding firm to their faith in God. “The Hawaiian Quilt” packs quite a bit into its approximately 250 pages. The main character is Ellen Lambright, but there is also a diverse cast of supporting characters who take the story in different directions that eventually converge. Some of the time lapses in the story were a bit disconcerting, although this did not really interrupt the flow of the narrative. Partly due to the number of characters, there was a constant sense of action, which made the story seem to unfold quickly. Ellen’s life changes dramatically more than once, and the challenges that she and her friends face are relevant to contemporary readers, from illness to friendship to romance. How they approach these tests of faith is inspirational, as is the mingling of both the English and the Amish world, which also extends to the reading experience with interspersed Pennsylvania Dutch vocabulary, making this an interesting and thought-provoking read.